You want to make more impact with your marketing but you don’t know where to start. And you’re fed up spending hours and hours creating content so you’ll be seen in all the right places. Marketing Made Easy gives you what you need to make your content work harder for you and make more impact. If you’re marketing isn’t effective you won’t attract clients. Make more impact and start growing your business. Get 4 videos that show you the steps you need and the know how to start attracting your consistent stream of clients. 4 workbooks full of fab questions and exercises to help you get clear on how you can get your business out there, find your clients and create your detailed month by month week by week marketing plan. A listen in version of the video tutorials for when you’re on the go. Get your hands on it today! 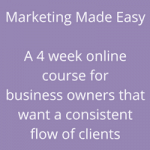 Marketing Made Easy - Self Study A 4 week online course for business owners that want to have a consistent flow of clients.